Step 1: If you want to add people to your e-goi lists using Icegram, follow these steps. Step 2: After entering your E-goi account, click to the ‘FORM‘ button present on the main menu bar. 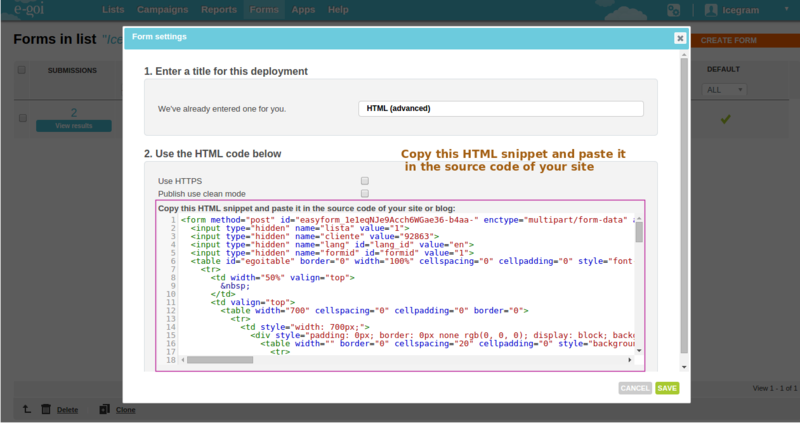 Step 7: A window opens ups with the html snippet in it. Step 8: Copy paste this html snippet and add it to the ‘Embed Form‘ option of the desired Icegram’s message type. And follow form embedding steps as usual. For a better understanding kindly look at the snapshots below.